Our greatest satisfaction is to refer to you or your loved ones the most professional and compassionate caregivers. Value Care’s Five Star Promise is specifically designed to provide our clients with access to referrals for caregivers that are more experienced, better at communicating, and better at essential skills like transferring clients who are concerned about their balance. Our Five Star Promise refers to the extensive screening, background checks and testing that all caregivers must go through before we ever consider referring them to you. Our Five Star Promise is unique to our industry and goes well beyond State of Florida requirements. We interview and carefully screen experienced caregivers in person, with our dedicated referral specialist team. We administer a series of competency tests that go far above and beyond the State of Florida’s basic requirements. With Value Care, every caregiver’s references must be specific to the home healthcare industry. Our 5 Star screening process isn’t easy: In 2010, 40% of applicants failed our written competency test. We actively seek out the most qualified caregivers looking for extra: skills, knowledge and experience. What is the ultimate proof that our tests works? Thousands of satisfied clients, and a steady stream of referrals from distinguished health care professionals throughout Florida. The safety of your loved one is our #1 priority. Experienced caregivers will support your everyday routine, and the unexpected. We look for success stories from clients and their families. For the safety of your loved ones, caregivers are able to clearly speak and understand English (Other languages spoken too). This test shows that caregivers thoroughly understand the essentials of working with your loved ones. Caregivers must transfer a fully sized a fully weighted medical mannequin from a wheel chair. Why do we take all these extra steps? Because you deserve it! Client Transfer = Client Safety. 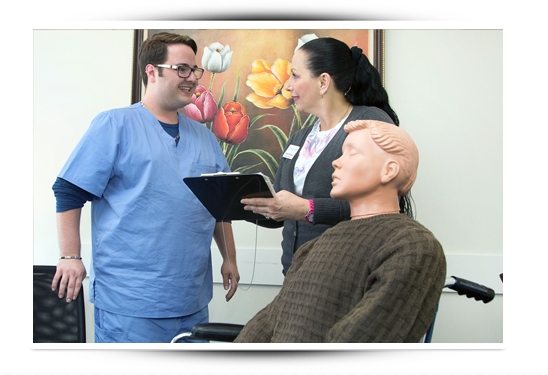 Caregivers registering at Value Care must demonstrate that they can safely transfer a heavily-weighted medical mannequin in our offices. Mastering this skill is critical because many clients are at risk of falling. To learn more about our Five Star Promise, please Call Us Today.